SUNY New Paltz is the first institution of higher education to be designated a Stratasys-MakerBot Additive Research & Teaching or SMART lab by Stratasys, the largest 3D printer company in the world. The announcement came during an open house for the Hudson Valley Advanced Manufacturing Center (HVAMC) on June 22. The open house also saw the official announcement of a new, 18-credit minor in digital design and fabrication—the result of a unique partnership between the Schools of Fine & Performing Arts and Science & Engineering to prepare a new generation of students to conceptualize and design for 21st century manufacturing. The minor’s interdisciplinary curriculum combines courses in material studies and other fundamentals of fabrication with courses covering computer-aided design principles, all developed with a keen sense of the importance of aesthetics to the challenges posed by modern manufacturing. It culminates with a capstone course focused on the application of these principles to the manufacture of functional solutions to real-world problems. Andrew Winchell, director of operations for State Senator John Bonacic, attended the HVAMC open house to express continuing support of New Paltz’s 3D initiative on the Senator’s behalf. State funding secured by the Senator, in addition to a $10 million NYSUNY2020 grant and investment of institutional funds, will provide the College with a 22,000-square-foot Engineering Innovation Hub to house our 3D initiative and our mechanical engineering program. The Hub is expected to open in fall 2019. 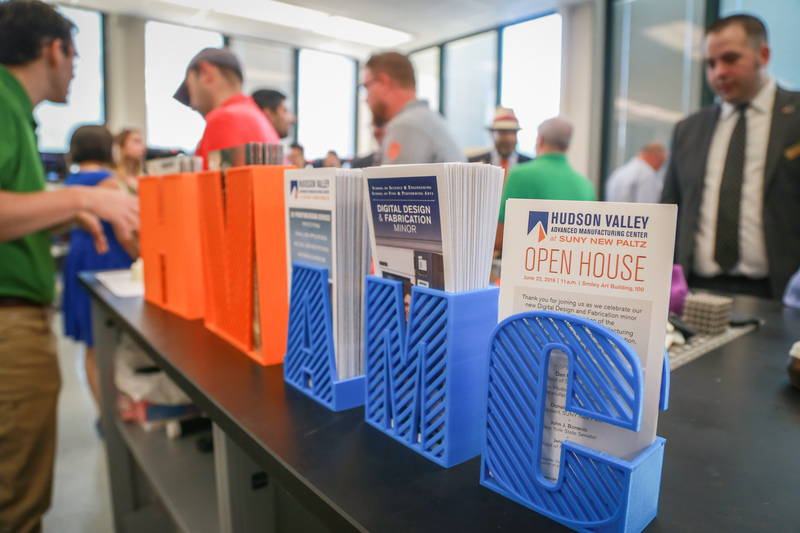 The HVAMC provides expert advice on the 3D printing process, materials and design for additive manufacturing to SUNY New Paltz and the Hudson Valley business community. Our collection of 3D printers constitute some of the most advanced technology at any academic lab in the country and is available for the campus and the wider community. SUNY New Paltz’s interdisciplinary minor in digital design and fabrication encourages research and innovation across fields to provide students with a foundation in design thinking for a modern world. More information about Digital Design & Fabrication and the Hudson Valley Advanced Manufacturing Center at SUNY New Paltz is available online.